Is Air Pollution in Kolkata on the Same Path as Delhi? While all eyes are trained at Delhi’s terrible air quality which is bringing down the average life expectancy of its residents by almost 10 years, air pollution in Kolkata is steadily giving stiff competition to the capital. The Air Quality Life Index or AQLI study developed by the University of Chicago’s Energy Policy Institute calculated that Delhi is among the topmost areas that are worst affected by deteriorating air quality based on readings from the year 2016. However, recent national statistics have shown Kolkata catching up with the polluted Delhi air. According to the Air Quality Index (AQI) website of the Central Pollution Control Board, the air quality of Kolkata following the festive week of Kali Puja, Diwali and Chhatth Puja was in their parameters ranging from ‘very poor’ to ‘severe’. This development made the city overtake Delhi to become the most polluted metropolis of the country. The AQI is calculated for five major air pollutants and out of these, ground-level ozone and particle pollution (airborne particles or particulate matter) are the chief health hazards for Indians. When air pollution in Kolkata surpassed Delhi in terms of deteriorating air quality, it was clocking an average AQI of 304 in Victoria Memorial and 385 in Rabindra Bharati University areas in a span of 24 hours on Thursday, November 15, 2018. An AQI value over 300 means hazardous air quality with a heightened potential to affect public health. Natural climatic conditions such as the forming of the Gaza cyclone over Tamil Nadu, the absence of rain, etc. is not helping the suspended particles from clearing up and making Kolkata increasingly smog covered. Given that winters don’t treat Kolkata air quality with much love due to low wind speed, mellow temperatures, high moisture level and inverse trapping of particulate matters, there are, however, contributing causes that should not be ignored anymore. 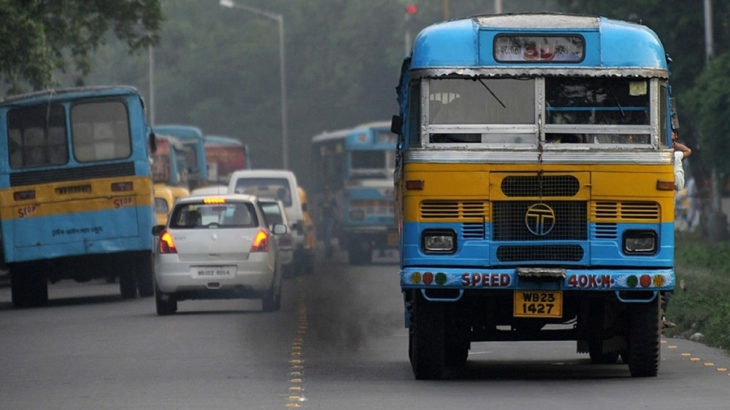 Diesel vehicle pollution is on a steady rise in Kolkata which is also known as the diesel capital of India. Almost 99 percent of the city’s commercial fleet uses diesel, add to this the trucks that enter the state every night, as also the new car sales where 65 percent are diesel driven versions that add to the poor air quality. Lack of a cleaner fuel like, CNG or CBM is acutely being felt in Kolkata. Construction dust pollution is also a big contributing factor to the high air pollution in Kolkata. As a popular TV advertisement wisely says, ‘India is an under-construction country…so dust is inevitable…’ This is especially true of Kolkata with major residential and commercial real estate development and infrastructure projects are going on at this point in time. In a 2016 report by the NGO Toxic Link, 17 critical areas were identified as sites with environmentally hazardous industrial activities. Although banned, industrial pollution flourishes within city limits due to lack of monitoring and law implementation. The adverse impacts of this worsening air quality situation are showing on the inhabitants. Respiratory problems are rising speedily, so much so that almost 70 percent of the population in the city is suffering from some or other related ailments. According to a study undertaken by the Chittaranjan Cancer Research Institute, 60 percent of Kolkata’s children were diagnosed with lung function impairment due to increased pollution levels. People who are a part of the solution, such as public transport users and walkers are inhaling highly polluted air putting them at risk of extreme levels of exposure. This polluted air contains a high level of toxins, most of them carcinogenic, which are dangerous even in low doses. The city needs to sit up and take firm action against all sources of pollution, including trash burning, road dust among others to meet a permissible air quality. But the topmost priority in curbing this menace should be controlling vehicular transmission. Kolkata should utilise the benefits of its compact city design which has the potential to keep commuting trip lengths short. Moreover, Delhi should be a lesson to Kolkata in finding solutions for congestion. Building more roads is not the answer, strengthening public transport, providing cleaner fuel options and reinventing pedestrian infrastructure are. Besides, the city needs a solid framework of rules and laws that should govern the construction and industrial emissions. The good news is that the Government is already taking initiatives to control the menace of pollution in the city. For example, the Kolkata Municipal Corporation (KMC) has installed air pollution control devices and pollution-free wooden pyres at several crematoriums across the city. The West Bengal Pollution Control Board (WBPCB) has taken measures like recycling toxic waste materials and setting up pollution monitoring stations at various points in the city. However, stronger efforts need to be enforced towards curbing vehicular emissions, such as routine checking of public vehicles, taking old vehicles off-road, and mandating the use of eco-friendly fuel. But the responsibility is not all on the Government’s side. The citizens also should be proactive in ensuring that they don’t add to the pollution problem while taking steps to stay safe in the current conditions. One of the immediate steps you can take include availing carpool services or shared cabs instead of opting for individual or one-person rides — when more people start doing this, it is likely to reduce the pressure of traffic on road, eventually resulting in lower emissions. In fact, an MIT study found that carpooling can improve traffic, save money, and help the environment. Another obvious way to step up against air pollution is to say ‘no’ to firecrackers, while it’s true that firecrackers are the main attraction of countless celebrations so it may not be feasible to abandon them completely. Instead, a more realistic approach would be to organise community fireworks where numerous people can gather and enjoy a single show. In this way, a lesser amount of pollutants would be released into the environment. There are also some eco-friendly alternatives to firecrackers that you can check out here. By covering small distances on foot as opposed to taking out the bikes or cars, people can save fuel as well as reduce the amount of emissions. You can also avail options like PEDL — an app-based cycle sharing service — instead of taking a bus or taxi. These small measures, when taken collectively, can make a big difference. As of now, PEDL is only present in a few locations in Kolkata. These kinds of services should be made available throughout the city so that people get habituated of avoiding scooters, motorcycles & cars for short distance trips. If such initiatives are appreciated then we may have other innovations from various other startups. Talking of enhancing greenery, most of us want to contribute but for many reasons, are unable to execute. Lack of free time, inadequate knowledge about which plants/trees will suit the available amount of space or more beneficial for environment, how to take care of the plants, etc. are some of the common reasons. However, solutions to these are now available in the market. Keeping these drawbacks of individuals in mind, few service providers have come up with services wherein they take care of the entire activity of planting trees. You just need to provide the space. The charges are also minimal so anyone can avail these services. Community efforts can also be a great way to act against the receding greenery in Kolkata. Citizens can form action groups and spend some of their free time planting trees and restoring green patches in neighborhoods. Of late it has been observed that many business houses have focused on green initiatives through their CSR activities. This is a great indication and they should also run more awareness campaigns for other business houses to join this movement. We are all aware of the dangers of deforestation and lament the loss of greenery in our city, but most of us don’t contribute towards remedying the situation. It’s time to change this attitude, if not for anything else, for our own safety. Why is Hyderabad India’s Most Livable Metro City?